We work in collaboration with oral surgeons in Melbourne & Sydney; we are the wisdom teeth professionals! We are a health team dedicated exclusively to the painless, efficient and safe wisdom teeth removal, dental emergency and tooth extraction cost in Melbourne and Sydney. Our professionals have a unique approach to ensuring every aspect of your treatment is as relaxed and calm as possible, and use the latest dental technology and techniques available to support our safe and painless approach to oral surgery, tooth extraction and wisdom teeth removal. Dr Pinho (Dentist) , Dr Leon Anaf (Dentist) and Dr Albarbari (Oral surgeon) and associates have founded Wisdom Dental Emergency in Melbourne with the aim of providing affordable and safe oral surgery with the highest possible standard of dental care. The service takes phone calls 7 days a week and is in operation in several clinics around Melbourne and Sydney. The patient is always booked for an initial consultation where either appropriate treatment is taken or a surgical appointment is arranged for a later date. Dr Paulo Pinho (Dentist) is a dental surgeon who has been performing oral surgery for the past ten years. After years working in hospital trauma centers in Latin America and The United States with oral surgeons and other specialists, he was invited to move to Australia. Since receiving his license to practice dentistry in Australia in 2005, Dr Pinho has limited his practice to dental emergency, tooth extraction and wisdom teeth removal surgery in several clinics across Melbourne and Sydney. Dr Pinho (Dentist) worked as a part time dental officer at the oral surgery department of the Royal Dental Hospital in Melbourne for 4 years. In addition to performing oral surgery under Local Anaesthesia and IV sedation, Dr Pinho (Dentist) also operates on patients from all across Melbourne Victoria and Sydney under General Anaesthesia at private hospitals and at The Royal Dental Hospital Melbourne. The majority of procedures performed are tooth extraction, wisdom teeth removal surgery and full dental clearance for patients requiring dentures ( false teeth ). Dr Pinho (Dentist) performs the great majority of surgical tooth extractions and wisdom teeth removal at Wisdom Dental Emergency. 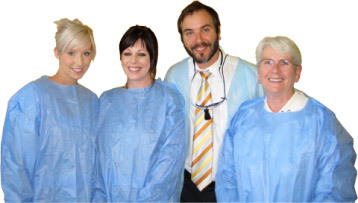 We understand that people feel nervous or dental phobic about dental procedures and tooth extraction in Melbourne and Sydney, whether that be due to negative childhood experiences, injection anxiety or toothache. At Wisdom Dental Emergency, we will identify your concerns, and use our years of experience in treating nervous patients to address these. We recognise that safe and painless dental care performed by a gentle dentist or an oral surgeon is crucial to good dentistry and oral surgery. We will endeavour to work with you to ensure that you feel confident and comfortable, with the full knowledge of what your procedure will involve, and why and how the procedure needs to be done. Call Us Free on 1800 WISDOM to find out more information.